I don’t speak French, but there are enough cognates that I think I get the gist of what they are saying over Disney/Pixar’s French site [via /Film] in their description of the still. 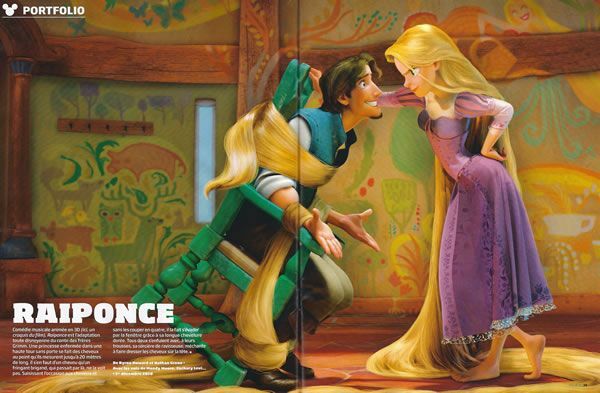 The image was scanned from the magazine Studio CinéLive, and features Rapunzel herself (Moore) and “le bandit” Flynn Ryder (Levi). The image is actually remarkably similar to a Rapunzel still we posted in July, except that a completely different character is caught in Rapunzel’s crosshairs. So it could be that tying people up is one of many hair-based running sight gags throughout the film. I’d like to note that Rapunzel’s neverending hair appears to be well-designed (i.e. nice texture, realistic interaction with surroundings). This is difficult in CG films, but probably crucial when telling such a hair-centric story. They’re also basing the CG on French Rococo artist Jean-Honore Fragonard’s painting “The Swing” so Rapunzel will probably look very different than any CG-animated movie we’ve seen.